This week's 'On Our Stereo' is written by Mark Orr, one half of LAB Records, a Manchester-based independent label that is just about to go full-time and is set to launch it's own clothing label. Since starting the label with Nathen McVittie in 2007, LAB Records has gone on to produce some of most promising music in Britain, including MiMi Soya, The Honeymoon Suite and The Auteur. 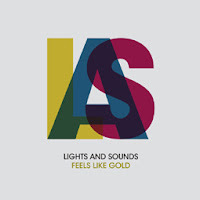 Mark has kindly enough wrote about The Auteur's recent tour buddies, Lights And Sounds and their debut EP, 'Feels Like Gold'. 'It is rare to find a young band that are nothing but impressive both live, and on record. High Wycombe's Lights & Sounds aim to get some long overdue recognition on a wide scale with their own brand of piano-led pop. More information on Lights and Sounds can be found here. 'Feels Like Gold' can be ordered here. More information on LAB Records can be found here.